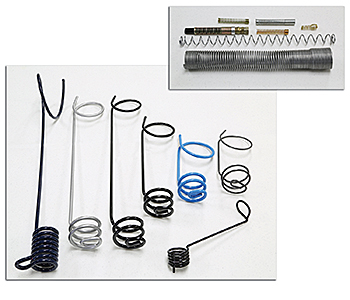 Myers Spring Company offers hose guards and supports to add reinforcements for any size hose. Many industries are served with both off-the-shelf and custom solutions. Myers Spring also offers several options for coatings, including Epoxy and Acrylic E-Coat, Powder Coat, Pre-plated wire, as well as Zinc Plating. Stainless Steel is also an option in some wire ranges.